The case system in Russian is complicated, but important. For example, the Genitive case (2) is one of the most popular in Russian. And, since we have already considered the changes in nouns in the singular (here), now let's look at the rules for the noun forms in the plural. But, first notice that the plural forms of the Genitive case (2) are formed from the singular forms of nouns in the Nominative case (1). -ЕЙ have all the nouns that end in Ж, Ш, Ч, Щ and -Ь. By the way, the ending -Ь changes to -ЕЙ. no ending have nouns that end in -А or -Я.
студентка - студентОк, ручка - ручЕк, девушка - девушЕк, сестра - сестЁр, сумка - сумОк, песня - песЕн. 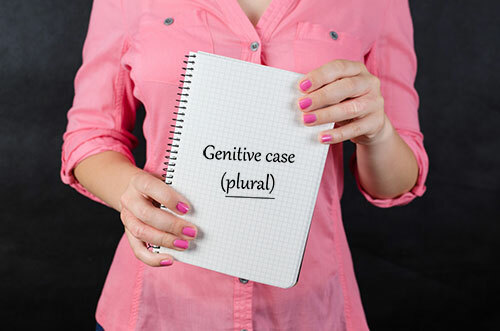 Thus, the changes in the endings in the Genitive case (2) plural can have several options. But they are formed from nouns in singular.